Thrangu Rinpoche (pronounced TRONG-goo RIN-poh-chay) was born in 1933 in Kham, Tibet. He is a prominent tulku (reincarnate lama) in the Kagyu school of Tibetan Buddhism, the ninth reincarnation in his particular line. His full name and title is the Very Venerable Ninth Khenchen Thrangu Tulku, Karma LodrÃ¶ Lungrik Maway Senge. «Khenchen» denotes great scholarly accomplishment, and the term «Rinpoche« is an honorific title commonly afforded to Tibetan lamas. At the age of thirty-five Thrangu Rinpoche took the geshe examination in Bengal and was awarded the degree of Geshe Lharampa, the highest degree conferred in the Gelug trasmission (it is not uncommon for monks of other lineage to pursue studies in that tradition). He was subsequently awarded the Khenchen degree of the Kagyu tradition. He played a critical role in the recovery of important Buddhist texts that had been largely destroyed by the Chinese Communists. He was named Abbot of Rumtek monastery, the home monastery in exile of the Karmapa, and also of the Nalanda Institute for Higher Buddhist Studies at Rumtek. As Abbot of the Nalanda Institute, Thrangu Rinpoche and Khenpo Tsultrim Gyamtso Rinpoche trained all the younger tulkus of the lineage, including the Dzogchen Ponlop Rinpoche, who was in the first class. 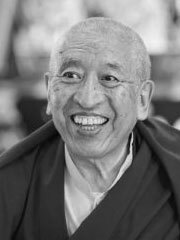 He was also the personal tutor of the four principal Karma Kagyu tulkus: Shamar Rinpoche, Tai Situ Rinpoche, Jamgon Kongtrul Rinpoche, and Gyaltsab Rinpoche. Thrangu Rinpoche established the fundamental curriculum of the Karma Kagyu lineage taught at Rumtek. In addition, he taught with Khenpo Karthar, who had been a teacher at Thrangu Rinpoche’s monastery in Tibet before 1959, and who is now head of Karma Triyana Dharmachakra in Woodstock, New York, the seat of His Holiness Karmapa in North America. In 1976, after twenty years at Rumtek, Thrangu Rinpoche founded the Thrangu Tashi Choling monastery in Boudhanath, Kathmandu, Nepal, and later also founded a retreat center and college at Namo Buddha; Tara Abbey, which offers a full dharma education for Tibetan nuns leading to a khenpo degree; a school in Boudhanath for the general education of Tibetan children and young monks in Western subjects and Buddhist studies; and a free medical clinic in an impoverished area of Nepal. Thrangu Rinpoche recently completed a large monastery in Sarnath, India, overlooking the Deer Park where the Buddha gave his first teaching on the Four Noble Truths. The monastery is named Vajra Vidya in honor of the Sixteenth Karmapa. It is now the seat of the major annual Kagyu conference. In 1976, Thrangu Rinpoche began teaching Buddhism in the West and throughout Asia. In the United States and Canada, he established centers in Crestone, Colorado, Maine and California, and Edmonton, and has another fifteen centers in ten other countries. He is the Abbot of Gampo Abbey, a Karma Kagyu monastery in Cape Breton, Nova Scotia founded by his dharma brother Chogyam Trungpa Rinpoche, reflective of his close ties the Shambhala Buddhist community. Rinpoche currently resides in Nepal where he serves as senior tutor to Urgyen Trinley Dorje, who is recognized by nearly all senior Kagyu lineage holders as the 17th Karmapa. What’s recommended is that if you have a good experience, don’t get too excited. And if you have a bad experience, don’t mistake it for a serious deviation or a sidetrack that you have to find your way back from. If you have a bad experience, just continue practicing as you were. In other words, whatever happens, just keep looking at your mind. In general, at a precise moment in time, when disciples’ merit and the Lama’s compassion connect with each other, the great and genuine beings will give up one emanation body and appear in another. Once again, disciples will be able to meet face to face with the supreme emanations, and to enjoy their portion of the nectar of their Lama’s speech. These prayers and mantras show us how to express thoughts which are most noble, which are completely beneficial, pure, and good. Part of our Dharma practice is to study, the reciting of texts, prayers, and mantras which bring about the very excellent training of the best of speech. All of these activities sow the seeds for good and right things in our mind which will afterwards become the basis for the expression of what will benefit ourselves and others. This is perhaps even more important today than it was in the past because we have such powerful means of communication. We should always be aware of the potential of communication and speech to either benefit or harm others. There are several realms which ordinary persons do not perceive. Because they cannot see them, that doesn’t mean they don’t exist. One of these realms is the sambhogakaya that can only be visited by highly realized Bodhisattvas. In the pure realm of the sambhogakaya, the Dharma is continuously taught. One sambhogakaya realm is Tushita, which is presided over by the next Buddha, the Maitreya Buddha. Buddha Shakyamuni dwelled there before coming to earth to give Dharma teachings. The path of liberation is like leaping over the top of a mountain. Even though no living master may be present to teach the Dharma in actuality, generation after generation, people continue to see the Stupa with their eyes, receive blessings, understand that there are the Three Jewels in which they can place their trust, and in this way, naturally, the Dharma continues. In the same way, when building a Stupa for the remains of a great master, his power and blessings will remain. That is the reason to build a Stupa. Crystal Clear by Khenchen Trangu Rinpoche, translated by Erik Pema Kunsang. Boudhanath: Rangjung Yeshe Publications, 2003.